Natural defects or trauma to the nose can significantly alter your nasal appearance. A nose that is disproportionately sized or oddly shaped can have a negative impact on how you view yourself. As the focal point of the face, nasal structure plays an important role is creating an overall attractive facial appearance. If you wish to dramatically improve your appearance by enhancing your nose, rhinoplasty can sculpt a new nasal structure to restore balance and facial beauty. In his practice, Mr Gwanmesia now uses a modern 3D device that enables him to achieve a nasal appearance that allows for the restoration of natural facial balance and harmony. An overly large or crooked nose can detract from your facial appearance, and an extremely small nose may make the face appear unbalanced. Most patients seeking rhinoplasty wish to improve the size or shape of their nose to restore a more proportional and attractive facial appearance. Cartilage may be removed, repositioned, or added to custom-shape your new nasal structures. Nasal bridges can be poorly shaped due to genetics or due to improper healing following trauma. A deformed nasal bridge can result from a wide or dented appearance. Rhinoplasty is designed to narrow and smooth the bridge of the nose. Additionally, a drooping nasal tip can lead to a more prominent-looking nose. Your nose surgery can address the size or shape of your nasal tip by adjusting its overall shape and projection. Mr Gwanmesia’s goal for any rhinoplasty is to craft a nose that both enhances your facial appearance and provides completely natural-looking results. Targeting key nasal structures during your surgery will help obtain flawless rhinoplasty results. 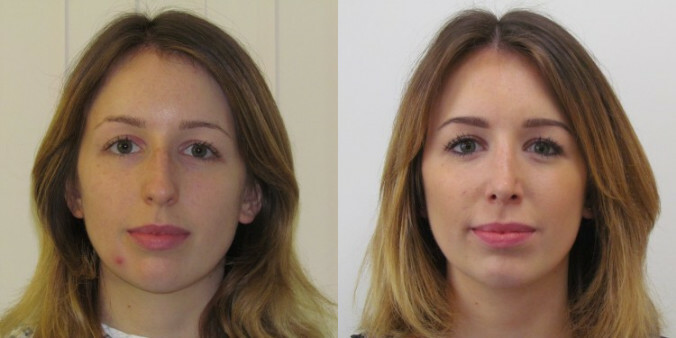 Adjusting the nostril size plays an important role in creating a balanced and natural nasal appearance. Modifying the angle of the nose’s bridge so it has a subtle slope will also help create a more natural nasal shape. You will experience bruising and swelling following your procedure. Ice packs can be applied to help minimise swelling. A nasal cast and splints are used to support the nasal structures during the healing process. Most patients can return to work one week after their procedure. You can resume your regular activities four weeks after your surgery. Major swelling will last six weeks, and minor swelling can last for several more months. If an open technique is used for your rhinoplasty, you may develop a small scar at the base of your nose. This scar can easily be covered using makeup and is likely to fade over time. A closed rhinoplasty doesn’t result in any visible scarring. An anaesthetic is used during your rhinoplasty to ensure a painless procedure. Swelling during the recovery process can cause some discomfort. Oral pain medication can be used to control any associated discomfort. Q. What type of anaesthesia is used during a rhinoplasty procedure? Most patients will require the use of a general anaesthetic. However, patients requiring only minor corrections using a closed technique may be able to use a local anaesthetic. Q. How old do you have to be to undergo rhinoplasty? Rhinoplasty can provide a number of emotional and physiological benefits for teens and adults. Nose surgery should only be performed on patients with complete facial growth, which usually occurs around 16 years of age for girls and 17 years of age for boys. Q. How long does the rhinoplasty procedure take? In most cases, the rhinoplasty procedure lasts between two and three hours. The length of time will depend on the necessary corrections and adjustments needed to achieve your desired results. Q. Will I have difficulty breathing following my rhinoplasty? The first several days following your procedure may be accompanied with breathing difficulties. Swelling and splints will likely obstruct the nasal passageways. This feeling is only temporary and doesn’t affect your overall health. Q. How long will my rhinoplasty results last? Rhinoplasty is designed to provide life-long correction to the nasal appearance. It is important to properly follow all aftercare instructions to ensure beautiful, lasting results. Q. Are there any potential risks associated with rhinoplasty? There are some risks involved with nose surgery. These include infection, poor wound healing, nose asymmetry, blood clots, and changes in skin sensation. Q. Can rhinoplasty fix my deviated septum? Rhinoplasty can address many issues related to a deviated septum and other breathing restrictions. Mr Gwanmesia can assess any problems you have and determine the best plan of action to correct your deviated septum. Some airway obstructions may be caused by the septum and can be treated by septoplasty. Q. Do I have to quit smoking before undergoing rhinoplasty? Yes, as smoking disrupts the healing process and can lead to post-op complications. To get the best results, you will be asked to stop smoking and stay smoke-free before and after surgery. Q. Which technique would I need for rhinoplasty? Because every nose is different, Mr Gwanmesia will determine the appropriate technique based on your anatomy and goals. You may experience some pain following your rhinoplasty. Mr Gwanmesia will prescribe pain medication to help reduce any discomfort.